Very Neato Book: Until Tuesday | KeaNeato! It was a casual moment; my father’s wife had been to the used bookstore and saw this book with a golden retriever on the cover. Since I like stories about dogs, and especially golden retrievers, she thought I would like this one. On her next visit, she passed it on to me without any thought to how it might affect my life. My has it affected my life! What a wonderful and terrible book! Wonderful because of the bond between Captain Luis Carlos Montalván and his service dog, Tuesday. Wonderful because of the narrative writing, the storytelling ability of the book’s author(s). Wonderful because of ECAD (Educated Canines Assisting with Disabilities) and its placement of dogs with veterans and others who need assistance. Terrible because of what Montalván had to go through, what soldier after soldier after marine after sailor after airman has had to go through since the first Gulf War. Terrible because of the pain that flows through Montalván’s writing, because of his injuries and PTSD, the haunting memories of Iraq and almost losing his life, and his treatment or mistreatment back in the States. But wonderful again because of how things come together in the end. I felt a bond with both Montalván and Tuesday because of my respect for the armed services, because of my love for dogs, because my last golden retriever had volunteered with me as a therapy dog at the local hospital, and for other reasons I might discuss here or in another blog someday. I also felt a bond because my uncle served in the first Gulf War as a Navy corpsman embedded with Marine troops in the desert. Among other problems, he suffers terribly from Gulf War Syndrome. My niece also served in Iraq, and I am proud to say she did a great job as a Seabee (Navy construction brigade). Back to the book: Used books are great, but I know buying used is no help to the author and to others who benefit from the sale of new books. I knew I’d have to get another copy. And then — there was the opportunity! I had started following Montalván on Twitter and Facebook, along with Pets for Patriots. At some point, the offer came up to purchase the book at a slightly higher rate than the cover price, with the proceeds going to ECAD. OK, I know, that’s all good — but what was my real motivation? 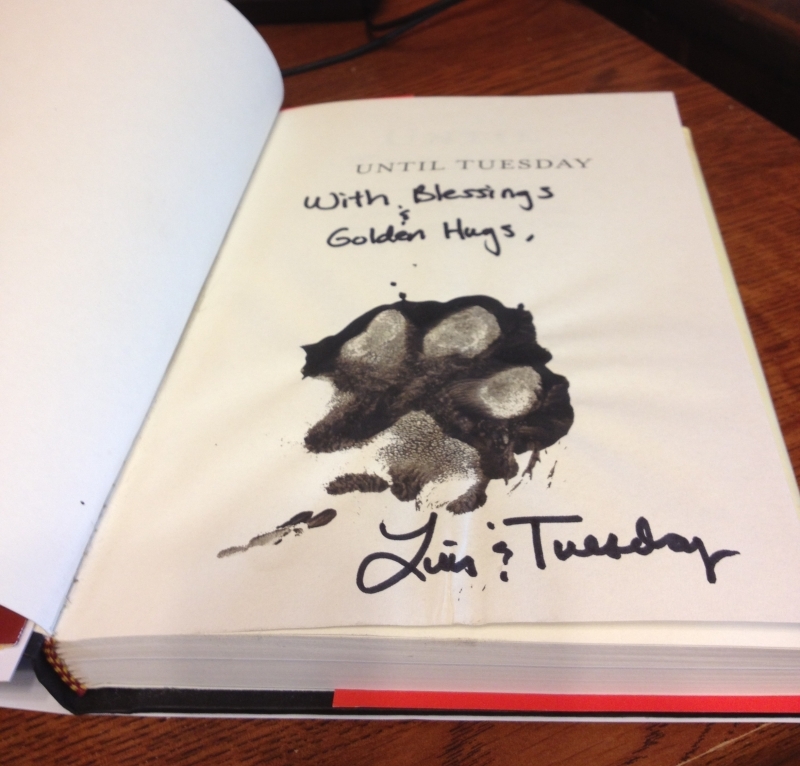 An autographed copy with paw-print from Tuesday! I’m sorry, Luis, but, while your signature is nice and all, I truly wanted to see that Tuesday is a real dog, with a real, sloppy paw-print. I write this with a big grin on my face. Could it get better? Yes! The publisher released an audiobook version. What amazes me is that Montalván had the courage to read the book himself. Montalván has an excellent speaking voice, not too deep, not too soft, but not loud either. Soft as if he were petting Tuesday while doing the narration. A little gravelly like some of the desert sand had come home with him in his voice. Listening to Montalván tell the most painful part of his story, I wanted to say, “Stop, stop! You don’t have to relive it again just to narrate this book. Get someone else to do this part.” But I’m glad Montalván was the sole voice in the book; he creates a real connection with his listener. I know I will listen to the book again; maybe several times. This entry was posted in brilliant, dogs, educational, impactful, Life, notable and tagged assistance dogs, book, ECAD, Luis Carlos Montalván, PTSD, Until Tuesday, war. Bookmark the permalink. I never did get to see him or meet him, which is really too bad. He was a remarkable person.